I just returned from a few days at Dreamforce in San Francisco, the annual circus-slash-conference hosted by CRM leader Salesforce.com, and was struck by the wave of technologies on display that centered on analytics. Highlighted by the launch of Salesforce’s own analytics cloud, the current trend in marketing technology is clearly focused on helping marketers make smart decisions and build smarter campaigns. Just when did demand generation get this complicated? In reality, however, things aren’t quite so convoluted. The simple act of generating leads – primarily through online means – has never been easier. However, the new wave of marketing technologies may be signaling a growing acknowledgment that simply “feeding the funnel” isn’t enough – marketers need to do a better job a) generating the right kind of leads, and b) increasing the rate at which all leads convert into opportunities and deals. This sentiment was borne out in a recent survey on lead generation strategy conducted by Ascend2 Research. 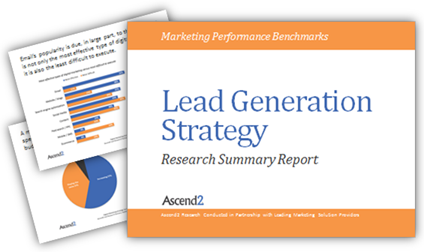 In results based on responses from more than 400 business leaders and marketing professionals, Ascend2 reported that marketers’ concerns about lead generation have veered away from lead volume and towards lead quality. • The #1 lead generation objective reported was “improving the quality of leads generated,” overtaking concerns about lead volume. • The #1 obstacle to lead generation success is the lack of an effective lead generation strategy (36%), narrowly beating out the lack of original and compelling content (33%). • Almost half of all respondents outsource some or all of their campaigns to an agency or outside consultant. Yes, marketing technologies – and marketing automation in particular – make it easier than ever for companies to generate campaigns and leads. (Ascend2’s research also reported that marketers view email as the least difficult lead gen tactic to execute.) Where marketing technologies are falling short – that is, until now – is helping marketers make smart decisions about the type of campaigns, content, and audience profiles most likely to generate real ROI. Predictive analytics and similar advancements will help close the gap. As will partnering with strategic advisors – consultants, agencies, and other qualified service providers – who know best how to leverage data insights, and have the experience and track record to back it up, in driving demand generation success. This entry was posted in B2B Marketing, Campaign Strategy, Demand Generation, lead generation, Marketing Automation and tagged Ascend2, Ascend2 Research, demand generation agency, demand generation strategy, demand generation success, demand generation tips, Marketing Automation, marketing automation consultants, marketing technology, predictive analytics on October 20, 2014 by Howard Sewell.